The magic of the FA Cup remains a key part of English football. Fulfilling the dream of lifting the trophy has motivated clubs up and down the country every year since 1871, while the competition has also given supporters, players and managers some of their most treasured memories. The status of the FA Cup may have diminished in recent years, but the magic is still there for those willing to look hard enough. The preliminary stage of the tournament is often the best place to find it, as non-league clubs – some old, some new – strive to reach the First Round proper. This was clear on an otherwise grim day in Hertfordshire last month. There was an unmistakable sense of occasion in the air which wasn’t going to be dampened by a bit of rain. FA Cup weekend had come around again and supporters had turned up in their droves, drawn in by the prospect of seeing their team secure a place in the next round. This isn’t your average non-league crowd, however. 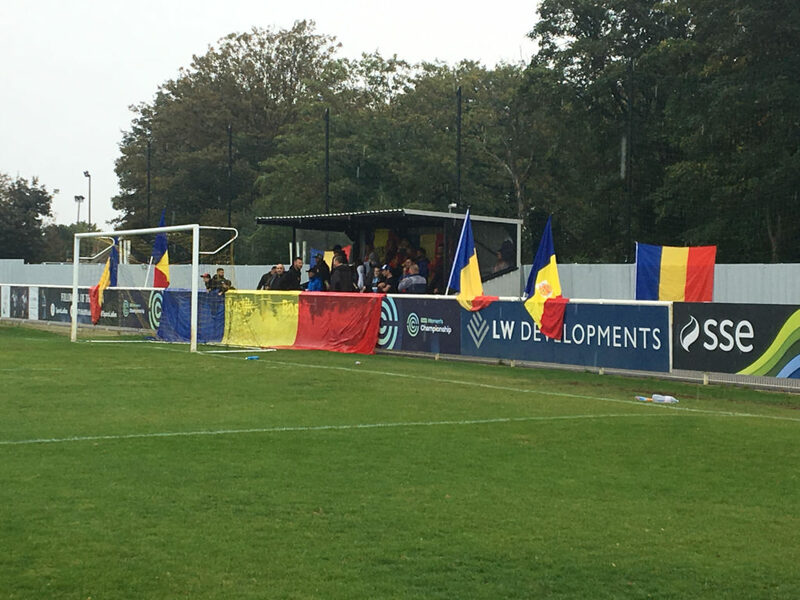 The tiny stand behind the goal at the Cheshunt Stadium is adorned in blue, yellow and red flags and filled with Romanian fans incessantly banging drums. The reason? FC Romania are hosting Beaconsfield Town in the Second Qualifying Round. FC Romania were formed in 2006 by Ion Vintila, who still serves as player-manager. Vintila started the club after moving to England so he could continue playing football with friends and relieve the stresses of working life. After two years, FC Romania made the step up to non-league. “I was looking for a higher level and one of the things we wanted to do was play with this club in the FA Cup, one of the oldest competitions in the world,” Vintila says. Their first campaign in the non-league pyramid came in the Essex Business House Football League, but the Wolves have since worked their way up to the Bostik League South Central Division. During their ascent through the divisions, FC Romania have been afforded a level of attention usually reserved for non-league’s sleeping giants. 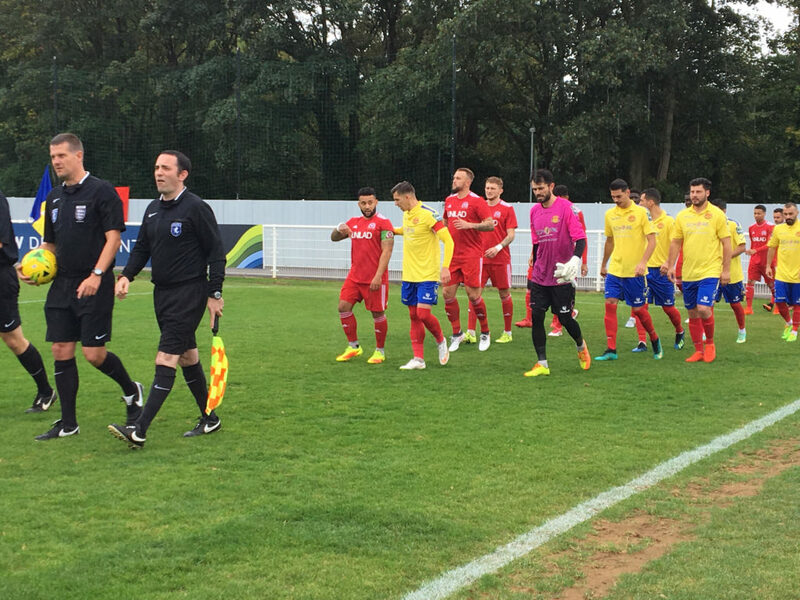 There was nothing but positivity ahead of FC Romania’s clash with Beaconsfield, though. This is a club who aren’t afraid to celebrate their culture and promote their country, as underlined by the story of 31-year-old player Gabriel Ghinea. “They [FC Romania] got in contact with me while I was still playing back in Romania,” the former FC National (now Progresul Bucaresti) and ACS Berceni man explains. This isn’t an exclusively Romanian side, however: leading line against Beaconsfield is Oliver Cleaver, the only Englishman representing the club in this Second Qualifying Round tie. “I want to do well in the league and FA Cup, but I think the FA Cup is quite special,” says Cleaver, whose brother Toby also plays for the Wolves. “It’s the biggest game this season for the club in my eyes. Every FA Cup game is the biggest game for the club and myself this season. We really want to win. FC Romania may be a league below Beaconsfield, but they’re the better team in the opening exchanges. They knock the ball around with ease, looking comfortable even when under pressure. Defender Felix Lupu epitomises their composure, repeatedly chesting the ball down rather than heading it away. Their centre-back may be calm, but FC Romania’s fans are anything but. There’s a constant stream of smoke coming from their stand as supporters light up cigarettes, presumably to calm their nerves. Their singing is even more constant than the smoking; if there’s a lull for even a second, the drummers look around until someone shouts at the top of their voice for everyone to join in. On the pitch, the underdogs can’t make the breakthrough before half-time despite being on top, and they’re made to pay for their lack of cutting edge in the second period when Beaconsfield take the lead. The face of goalscorer Jordan Ajanlekoko lights up as he wheels away in celebration, but the mood is very different among those of a FC Romania persuasion. The fans continue to support their team, but more frustration is evident in their tone now. “The players feel like they’re home because no one from our club has played for our national team, so they feel like they’re representing the community with the supporters behind them. They push us for the victory,” Vintila had said before the game. 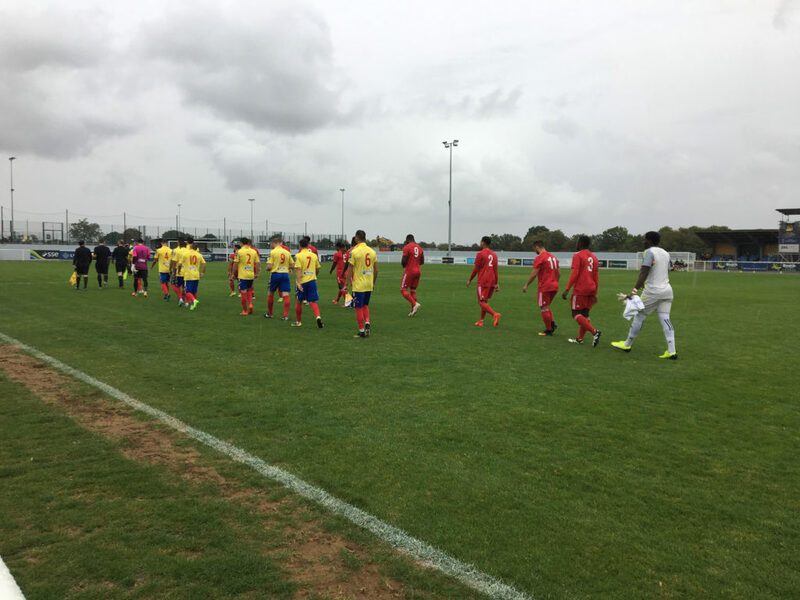 In the end, though, neither the FC Romania fans nor players are able to do enough to overcome Beaconsfield, who double their lead with 78 minutes gone. Ajanlekoko turns provider this time, laying the ball off to substitute Tre Mitford who duly applies the finishing touch. 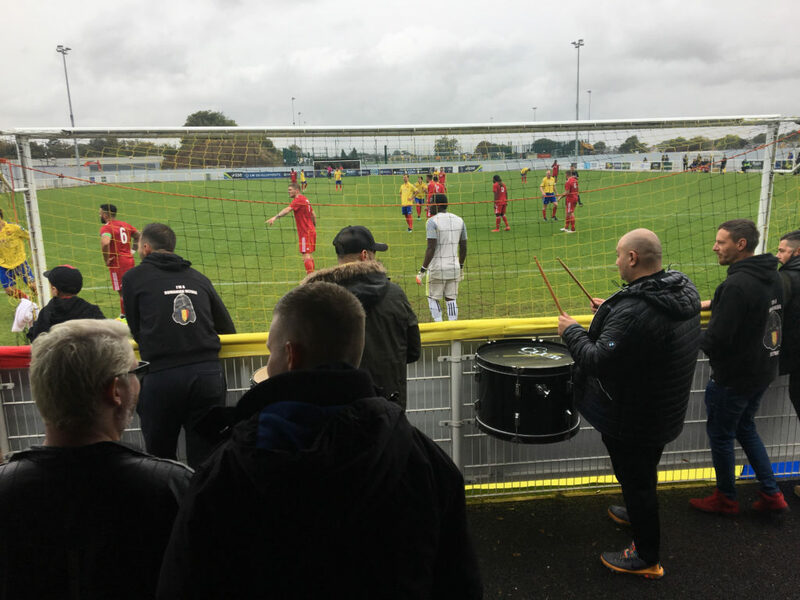 With their hopes of progression evaporating, FC Romania supporters shout in English for the first time, telling Beaconsfield’s striker what they think of his performance after he taunts them by signalling the scoreline. As Beaconsfield celebrate upon hearing the final whistle, there’s a mix of pride and disappointment among FC Romania fans and players. Those on the terraces applaud the efforts of their heroes, who return the sign of appreciation in kind. It’s only a small moment, but it sums up the community that Vintila has built. Before the game Vintila had revealed that the FA Cup was the club’s priority, and that they would only focus on the league once they had been knocked out. When walking away from the Cheshut Stadium, though, it felt as if the players and fans were already waiting for their next opportunity in the competition next year, their enthusiasm undulled despite the heartache of their elimination. That, more than anything, is the true magic of the FA Cup. Previous article20 years on from the birth of the SPL, is Scottish football actually any better off?